I said I wasn’t going to do a St. Patrick’s Day recipe. This blog has been here 2 years without an Irish-inspired dessert on it. I let March 17th come and go each year without pulling out the green food coloring. Mainly, because, well, I’m not Irish. Do they check your ID and look for an Irish last name before they let you order green beer at a bar? I’ve always had a suspicion. There isn’t a drop of Irish blood in this house, though you’d never know it because our wine fridge is full and the liquor cabinets are busting at the seems. All the more to bake with, my little pretties! Somehow, I have lived my life not knowing what a Shamrock shake was. I watched Mr. Dessert For Two’s eyes light up when he saw an ad for one at the Golden Arches in LA last weekend. This guy usually shuns all processed food, so I was shocked by his excitement. Well, he eats ice cream by the gallon, so maybe I shouldn’t have been. If you liked my Cherry Pie Milkshake, you’ll love this shake, too. It took me a while to come around to minty flavors. When I first met Mr. Dessert For Two, he told me he loved a good peanut butter and mint jelly sandwich. The thought of that sandwich haunted me for months. I’m happy to report that I’m embracing mint (sans peanut butter) just as warmly as he does right now. But this shake, this shake is something else. It’s not just minty—it’s also vanilla-y. I use pure vanilla bean paste because a friend gave me a bottle as a gift and I am in love with it. Substitute double the amount of extract if you don’t have it on hand. And the white whiskey? Oh man, are we fans of moonshine. That’s all I’ll say, considering it’s not quite legal everywhere. I have a few more moonshine-laden desserts up my sleeve. Stay tuned. 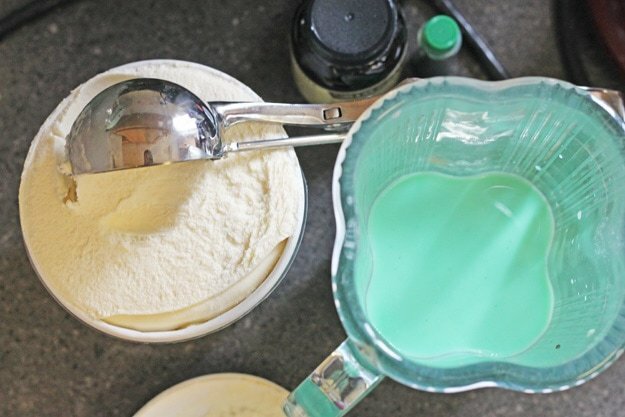 In a blender, add the milk, food coloring, peppermint extract and vanilla bean paste. Add the ice cream and blend until smooth. Stir in the white whiskey before serving, if desired. Loooove these! I don’t really have any St. Pat’s day recipes either and I’m probably posting one tomorrow just to jump on the bandwagon. I am already overloaded with green desserts! You are on your way to being the best wife ever! This looks so much better than whatever mess McDonald’s is selling! OH my heavens I seriously want to stick my tongue down in that! It would never even occur to me to make something for St Patrick’s Day, it’s funny how it’s far more of a big deal in the US than anywhere else! I can, however, get behind the idea of a good boozy milkshake! oh jeez, this looks amazing. i love the color.. I bet you can substitute frozen yogurt for ice cream and it would still be delish. pretty. this is so purrrty!! i love it. don’t worry, there’s not a drop of irish in me hahaha ;) mmm i’d totally be sipping on both those jars! I love an alcoholic milkshake. I can’t wait to try it. And you could probably use creme de menthe to flavor it and give it color. We always have a bottle that no one ever seems to drink. I think it was bought to make brownies. Sooo pretty! Love this idea! I have seen so many people sipping on those McDonald shakes… whatever..moonshine beats McDonalds every time!! I have never in my life had a Shamrock Shake. But I keep seeing recipes all over the place for them. They look so pretty with their mint green tint. I like how your recipe adds some vanilla bean paste as opposed to just using vanilla ice cream. I don’t ever celebrate St. Patrick’s Day either – this year my Mum’s birthday is the day before and Mothering Sunday the day after so it’s been completely pushed aside. 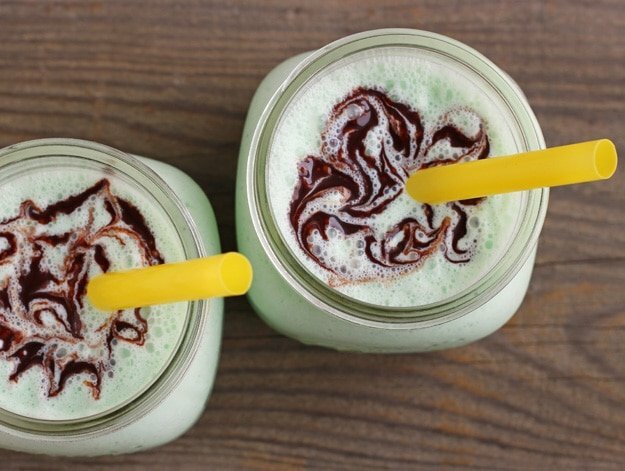 Still love the look of these shakes though – anything green is just so much fun! Peanut butter and mint jelly sandwich?!?! listen, you know I love me some peanut butter. But with mint jelly, that’s where I draw the line! Once when I was getting fro yo the pb flavor and the mint flavor we’re in the same area. So when you pulled the middle lever a pb mint swirl came out. I tried it. I then realized that was the ONE pb combination I just can not do. It was NASTY! Anyway! The shake sounds fantastic! All the minty, vanilly, whisky-y goodness. That’s a combo I can get behind! Oooh – I think I’m where you were several years ago in regards to mint. Though I could be swayed by the addition of alcohol :) I posted a green “not because of St Pattys day” dessert today too! 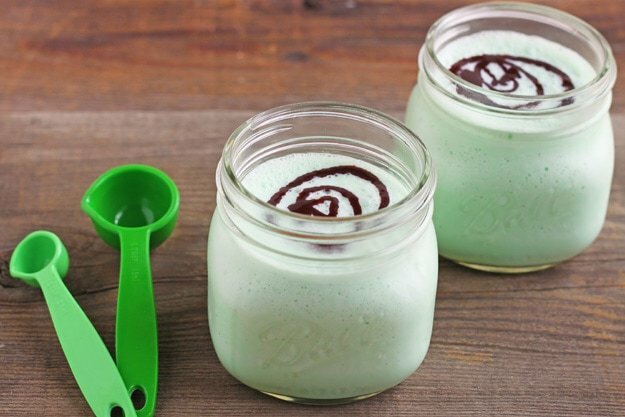 Shamrock shake looks awesome! I’ve seen quite the variety of ingredients in these shakes and I’m impressed by all of them. Your recipe looks great and refreshing. I said I wasn’t going to do a st. paddy’s day recipe either, but I keep thinking I should throw one down before the big day hits. :) Have a fun weekend! I LOVE mint–so, I will lhave to try this. Well I do have Irish blood. Lots of it. And this looks delicious! Mmmmnnn. I had a Shamrock shake the other day. Love your presentation. I didn’t know what a Shamrock Shake was either … but now I do! Looks good! Um, my husband and daughter are seriously going to love you for this. They are addicted to shamrock shakes! Yum! Yeah moonshine, good stuff! I have stories! You inspired me to make this on St Patricks day! But then I remembered Im trying to reduce sugar and had a kale smoothie with a shot of whiskey isntead. So basically you inspired that! Adorable! And leaps and bounds better than the original. My cocktail bartender friends call white whiskey “white dog,” a term I believe they picked up at one of the distilleries in Kentucky. I missed the Shamrock Shake this go round at McDonald’s, partly because I couldn’t bring myself to give money to that processed “food” mecca and partly bc their current updated “thick” shake isn’t the classic shamrock shake of my youth. I’ll give this one a whirl though to satisfy the craving! 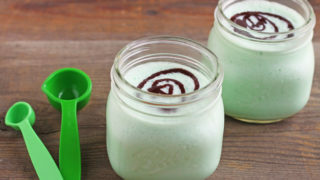 shamrock shake looks like a slam dunk of a drink especially with the mason jars + chocolate syrup + yellow straws (that’s detail)!